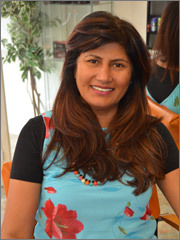 Miu is led by Durdana Shaikh, one of Glasgow’s top hair stylists, beauty experts and bridal specialists. Durdana is a highly creative, passionate individual whose wealth of expertise and various media interests feeds back into her salon work, keeping it fresh and exciting. Her experience over 30 years as a stylist and hair and make-up artist encompasses film and television drama, commercials, theatre and a radio beauty programme. She is also an actress, choreographer, dancer and BAFTA award winning film producer. She has a successful history of organising high profile charity fund raising events ranging from cancer relief to child poverty. From 2010, Miu will be at the forefront of these charitable works. Trained by and became a stylist to Alan Stewart, the hairdressing mastermind who created the Rainbow Room International. Worked in various salons around Glasgow, including the City Centre and Thomas Chivate’s in the West End before opening her own salon. Studied original hair, beauty and bridal techniques, including threading in Pakistan. Hair and makeup artist on five city tour of India Heer Ranja (an Indian Romeo and Juliet). Organiser and stylist for Cancer Relief Charity event, fashion show and theatre performance. Opened first salon Armand, in the West End, named after Durdana’s first child, cut a boy. L’Oreal colour competition semi finalist. Started Dance Asia, fusing western and eastern dance and fashion styles, sponsored by Scottish Ballet. BBC film Manji, hair and make up. Radio Awaz beauty and hair show consultant. Durdana has worked throughout the UK and internationally. Zeeshan has been a fully qualified, experienced barber and gents stylist for over six years but this has been apart of his life and a passion from a very young age. Zeeshan has been cutting and styling gents hair for years prior to getting into the trade fulltime. Zeeshan’s skills can range from a simple smart look or something with a cutting edge whatever it may be it can be done to give you the perfect hair style.